For those of you who stumble across this thinking, "What is #MCRchat?" -- #MCRchat is a scheduled twitter-based chat about My Chemical Romance that I started in an effort to bring fans together and to promote the band. 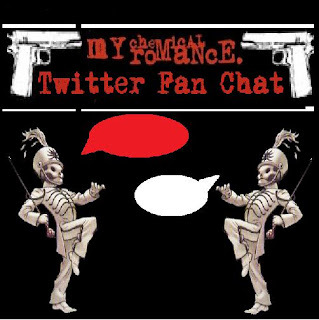 Recently, I was given the opportunity to give out special MCRchat-exclusive coupons for the official My Chemical Romance online store, which made me realize that I can do a lot more with the chat than offer a place for fans to meet and to promote MCR. I can give back to those who have helped MCRchat itself grow! Thus, I have decided to hold a contest with prizes for all you MCRchat-supporters! In 2006, The MCRmy (My Chem's official street-team), held a contest in which participants had to use promotional posters for The Black Parade to create a store display. I used mine to create a replica parade float that was displayed in my local Hot Topic. I didn't win the contest, but I had a few posters left over after I had completed the float, which doesn't exist anymore as of this year -sadface-. Some of the posters, I hung up around town, but a few of them I kept and have been hoarding away. These, my friends, will be your prizes since I recently won huge, signed versions of them through, what else, an MCRmy contest. I figured it's definitely time to share. Ha-ha! 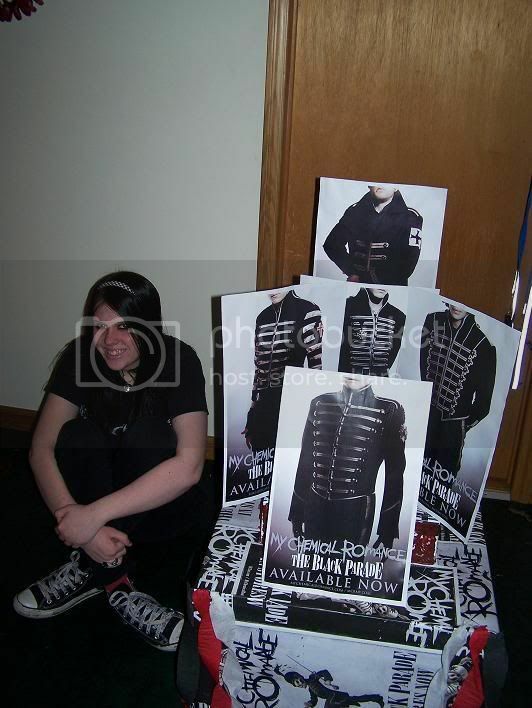 I apologize to MCRmy soldiers who already have these posters. There are five posters, there will be five winners and five different ways to win. Ready? Each of the five posters I will be giving out display the torso/Black Parade jacket of one member of MCR. There will be five contests to win them individually. To enter the contest, you must submit an original work, whether it be a drawing, a piece of writing (creative or essay), or a video inspired by the member whose poster you are trying to win. Be creative! If you are unsure about your entry, let me know and I will tell you if it is okay. -If submitting a writing work, no fanfiction. Use a personal testimonial. -NO USING OTHERS' WORK. Please submit original work that belongs to YOU. -Submit only ONE entry per contest. -Because of CRAZY expensive international shipping rates, I'm sorry, but this will be a U.S. only contest. -I CANNOT ACCEPT MONEY FOR SHIPPING/THE POSTERS; as, they were free, promotional posters of no monetary value. Any entries that break any of these rules (my judgment) will be disqualified. Submit your entries to CassieWhitt@Gmail.com with "Contest" and the name of the band member's poster you are trying to win in the subject line. Include a brief explanation of how your piece was inspired by the band member along with your twitter username. If I find you are not following #MCRchat on twitter, you will be disqualified. So, please remember to follow. All entries are to be submitted by February 1st! Further contest details will be announced on the @MyChemChat twitter page. After entries are submitted, I will hold a vote, and the winner will be decided! Keep your eyes open on twitter! ViennaKISS, MCRmy moderator and fan extraordinaire, has decided to give #MCRchat an additional 5 posters for the individual contest winners! View the poster here! I must get my hands on the Mikey poster. I'm practically salivating over it. I'm from Brazil I'm not able to be part, but good luck to those who will participate!!!! I really want to enter this, but I am still a little confused about somethings. I will write an essay, but is it like writing how much I love Frank or just about Frank. Like I don't know what would be correct for entry. Thanks. NOOOOOOOOOOOOOOOOOOOOOOOOOOOOOOOOOO!! ARGH I wish I wish I wish I lived in the U.S.. Bleh. Oh well. Do we get to see the entries? Warped Tour 2010 Bands Announced! The Starting Line to Tour?